Frances Burks : Surf-Board Riding, Waikiki, 1913. 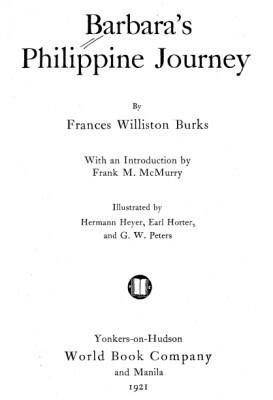 Introduction by Frank M. McMurry. World Book Company, Yonkers-on-Hudson and Manila, 1913. 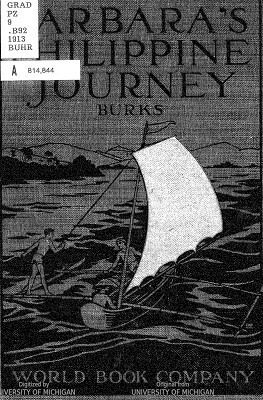 Junior fiction, the illustration based on the cover of Stoddard, Charles Warren: A Trip to Hawaii, Oceanic Steamship Co., San Francisco, 1897. .
Six days after we left San Francisco we reached Honolulu, and in that short time we had managed to change seasons again. It was so warm that I put on my short-sleeved dress, and we all went swimming on the beautiful Waikiki beach, which is bordered by palm trees. After we had all been splashing around awhile, Mother told me to sit on the warm sand and see what would happen. She said, "Ever since I was a little girl, I've wanted to ride the surf at Honolulu, and now Father and I are going to. try it." "How do you ride the surf, mother?" I asked. And then I saw a wonderful sight. 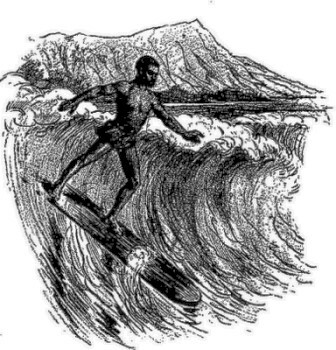 On top of a big, combing wave that was racing toward us, rode a man, standing upright. With flying hair, he shot along, balancing himself with his arms, as the lady did who rode the white horse in the circus. "How can he?" I asked. "Is it magic?" Then she turned to Father. "Come!" she said, "we'll have to try it." They never had ridden the surf before, you know, and part of the time they rode under the waves instead of on top of them. Sometimes all I could see of either parent would be an arm or a foot stuck out through the waves. But their heads always came up after a while, sputtering and laughing. Honolulu, with all its wonderful flowers and fruits and pretty colored fishes, was very beautiful, but ] was glad that we soon were on our ship again, when every day was bringing us nearer the Philippine Islands. Geoff Cater (2017) : Frances Burks : Surf-Board Riding, Waikiki, 1913.